As soon as the monsoon ends, Kathmandu Valley gears up for a number of festivals. The first among them is Indra Jatra. Clear skies bring enthusiasm amongst the people of the Valley who gear to celebrate this eight-day festival with a great deal of vigour and passion. 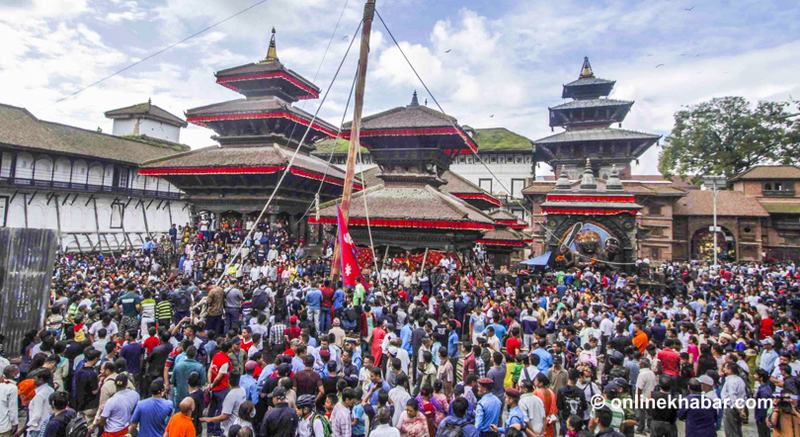 Indra Jatra has never been restricted to being a mere public formality. It is celebrated as a religious ceremony which concerns both urban and rural societies. 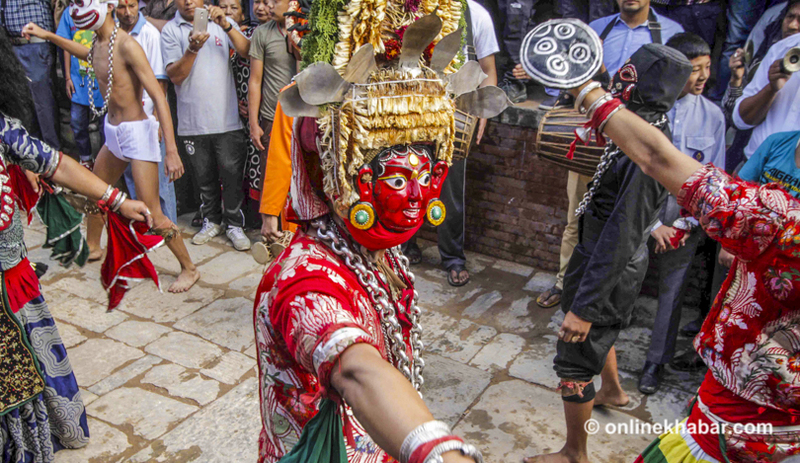 Indra Jatra is made up of three series of festivals, each concentrating on one specific god – Indra, Kumari and Bhairav. Initially, all three festivals existed independently and were joined together in a later stage. 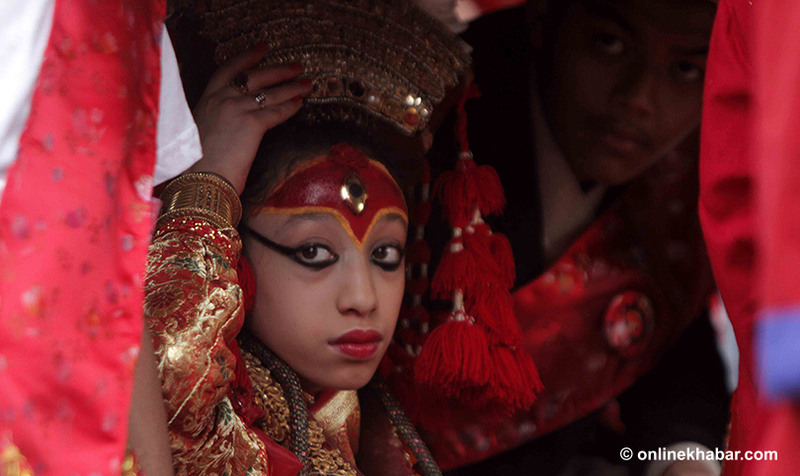 The Indra Jatra is the oldest part of this festival which dates back to the 11th century. The Kumari Jatra was later added to this procession by Jay Prakash Malla. It is believed that he detached this festival from Maha Nawami and wanted to dedicate a different day for Kumari (Living Goddess). Malla felt that this would strengthen the Malla dynasty which was under attack from the Shah dynasty in the late 1700s. The origin of the Bhairav Jatra, however, is not known. It is difficult to ascertain if it was celebrated in the beginning or came at a later stage. The Sveta Bhairav’s head in Basantapur came to existence only after the Malla era when Rana Bahadur Shah decided to honour Lord Indra. 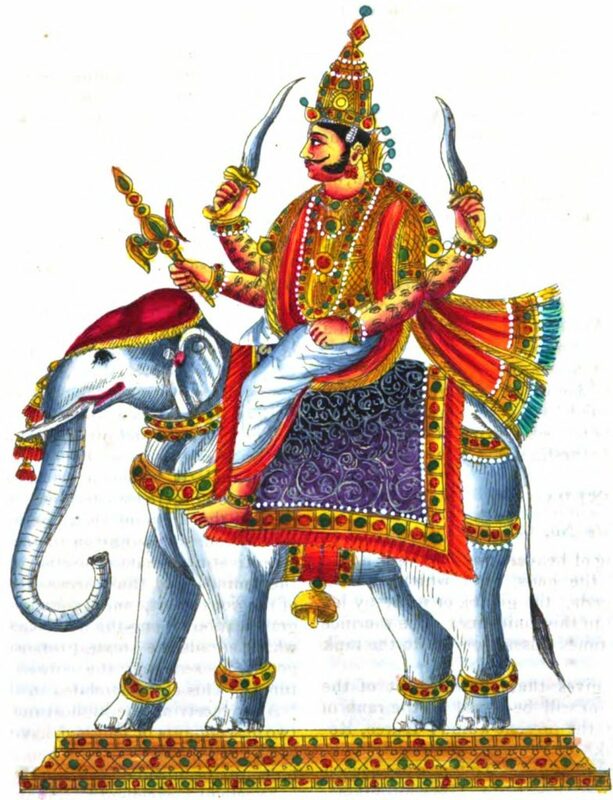 According to another legend, Indra’s mother Vasundhara came to Kathmandu disguised as a demoness in search of her son. When she found him in the palace bound up like a thief, she promised to ensure mist and dew for the winter crops in exchange for his release. She also promised to lead the inhabitants of Kathmandu to heaven to meet their deceased relatives. While the people heard this, they quickly released Indra and followed her when she departed with her son. But when they reached the top of the hill, from which they were to ascend to heaven, she informed them that they couldn’t go to heaven without purifying themselves in a pond known as Indra Daha. While the people were bathing in the pond, they were shrouded by a thick mist. Taking advantage of that, she escaped to heaven with Indra. There are many instances in holy books of a similar festival being celebrated in India to honour Lord Indra, called the Indramahotsava. Like in Nepal, rulers in India worshipped Indra too. The festival was celebrated around the same time in both countries. In India, they select a tree for the ‘lingo’ like in Nepal. However, the major revellers are Brahmins, not Newars, there. 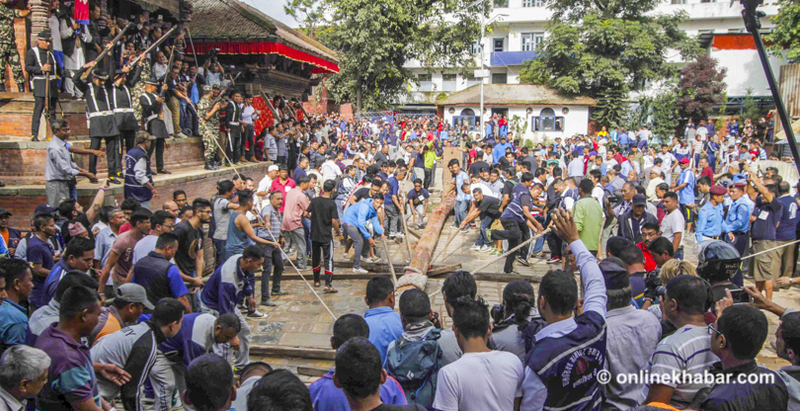 In Kathmandu, the tree is then immersed in the water and then brought to the capital where the procession takes place. The festival is celebrated for 12 days, after which the pole is lowered and taken to a nearby river with the help of an elephant. The festival is also quoted in the Mahabharata, in which this religious feat was initiated by a religious king called Vasu. Everyone knows about the pole (yashi) which is brought from Nala in Kavre. But while erecting the pole, a banner is placed on the 60 feet high pole which is known as Hari Patah. It is kept inside the old Malla palace of Hanuman Dhoka throughout the year. The banner has eight signs of good luck, also known as asta mangal. The pole also has branches and fruits, mostly bhogate which is the symbol of fertility. Along with it, a small national flag is fixed on the top of the pole. The banner is commonly referred to as the Indradhvaja and the pole raising ceremony is called Indradhvajotthana. Traditionally it was the Manandhar caste who cut the pole from a Sal tree in a small forest in Nala, Kavre. A goat was set free in the forest and the tree against which the goat rubbed its back was chosen. With the time, the rituals have been simplified and the selection of the tree and its transport has been given to another caste group. But the tree is cut a month before the festival and a goat is still sacrificed. Currently, police recruits have been given this task. 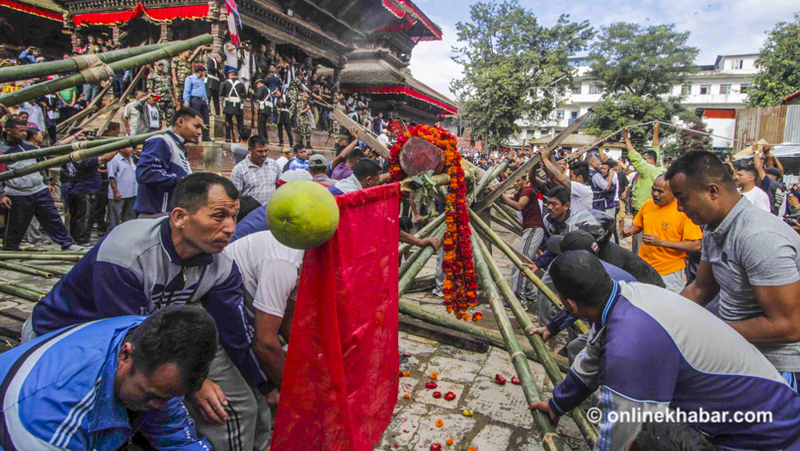 Related News Indra Jatra: Why Kathmandu remembers King of Heaven every year?